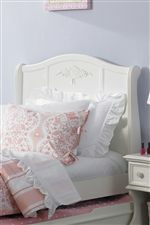 A floral embellishment on the headboard adds traditional style to this antique white finish sleigh bed with an arched headboard and footboard. 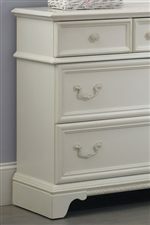 The bracket feet and molding details give the bed a pretty appeal that a girl will love for her bedroom whether she is a child, tween, or teen. An optional trundle storage unit provides a place to keep a mattress ready to roll out at a sleepover or keep belongings organized under the bed. This bed is available in twin and full sizes. The Arielle Youth Bedroom Traditional Twin Sleigh Bed at Ruby Gordon Home in the Rochester, Henrietta, Greece, Monroe County, New York area. Product availability may vary. Contact us for the most current availability on this product. 352-BR11H Twin Sleigh Headboard 1 42" 5" 49"
352-BR11F Twin Sleigh Footboard 1 42" 5" 27"
352-BR11R Twin Sleigh Rails 1 76" 2" 5"